Local authorities in Scotland must allow the public to look at their unaudited accounts, and Aberdeen City Council is no exception to this rule. In August 2012 this annual statutory period of time was granted for interested people to examine the city council’s financial year documents from 2011. 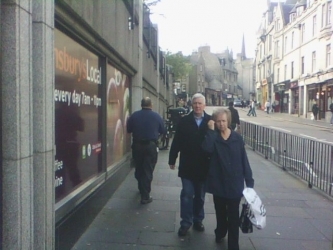 Paying Through The Nose: Part 1 looked at invoices Aberdeen City Council paid to Stewart Milne-related companies, the Wood Family Trust and the BiG Partnership. In the second and final part, Suzanne Kelly examines finances for the 2011 financial year relating to ACSEF, the Tree for Every Citizen scheme, foreign trips by city officials and more. In this allegedly environmentally-sound tree-planting scheme, the slogan A Tree for Every Citizen came first, and the science, economics and location for said saplings was a secondary concern. Tullos Hill was once a meadow filled with birds, plants, small mammals and deer. Thanks to the interventions of a minority, the hill is now largely a scarred, haphazard wasteland. Pete Leonard (Housing) and Aileen Malone (Lib Dem former convener, Housing & Environment Committee) promised councillor and citizen alike that their pet scheme was totally cost neutral. Who could object to a beautification project designed to combat Aberdeen’s large carbon footprint? Who could object to a scheme that wasn’t going to cost anyone anything? More to the point – who actually believed a polluted, windswept hill which had thus far failed to sustain many trees was going to become a lumber-producing, cost-neutral success story? It seems just a little amiss that the word ‘unknown’ should appear so many times on a summary of expenditure. It also seems amiss that the breakdown includes only one of the two C J Piper invoices I was supplied. The Hazlehead costs seem to be left out of this equation – and yet cutting these trees at Hazlehead down was, according to sources, one of the ways in which the Tree for Every Citizen scheme was paid for. Is the meagre £527.23 from Aberdeen City Council to the TFEC scheme related to the Hazlehead tree felling which earned Piper £1,422? If it is unrelated, then which city budget did this sum come from and what does it represent? Like so many things under our previous council and under Leonard and Chief Executive Watts, these ‘cost-neutral’ claims were a far cry from reality. 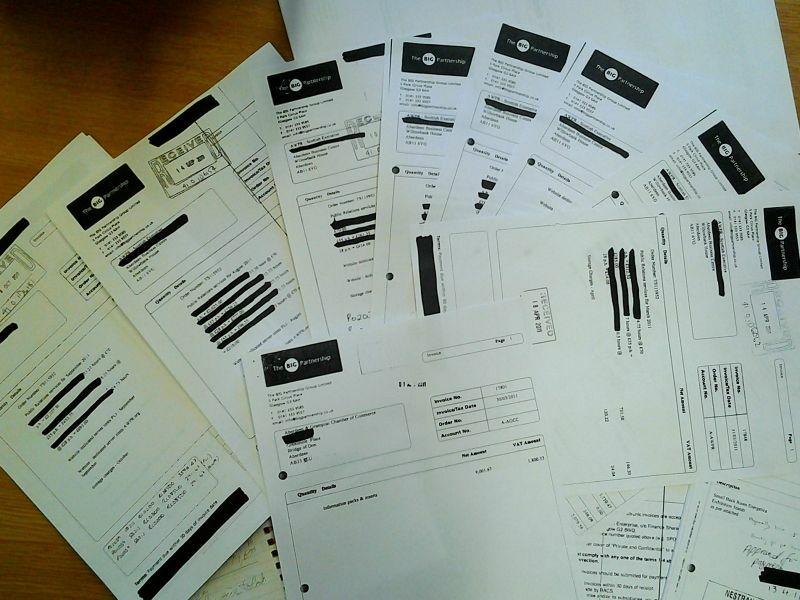 The total costs to December 2011 had already been released by the FOI office, and they were damning. After a great deal of coaxing, Watts conceded that £43,800 had been repaid to the Forestry Commission for the dismal failure of Phase I of the scheme. All who wanted Phase 2 to go ahead blamed the deer for the failure, even though the FC said the soil and weeds were largely to blame. Still, no one would have kept making money had the scheme been scrapped. Least of all Chris Piper. Getting sight of the Piper invoices was a long process; the FOI officers protected Piper’s identity at all costs for over a year, despite this being a person writing city reports which justified his further fees on this scheme, and receiving taxpayer money. Piper, a Forres-based tree expert, is invited to come forward and explain his determination the scheme would work, and how he produced a report jointly with the city which recommended the TFEC scheme (calling the many opponents ‘a vociferous minority’). How someone with a vested interest in a scheme proceeding can be allowed to author or co-author a report (no one at ACC put their name on the joint submission made to the FC) should be a matter for further investigation. The soil (or lack thereof), the wind, the weeds and use of herbicides alone should have stopped the scheme. (Note: at present nothing like 89,000 trees have been planted on Tullos despite this being the plan. Originally, some 20 deer were going to be culled in the first year – we now know it was closer to 36: which we paid some £6,000 to eliminate). No wonder the city and Piper were so keen to keep things quiet. As a footnote to those who believe the tree scheme will eventually be a successful carbon capture system of some sort, there are a few points to consider. Firstly, tearing out the existing vegetation ruined what carbon capture had been in place, and the earth moving vehicles used assuredly had a carbon footprint. Surprisingly formidable in terms of carbon footprint is the astonishing figure of 2,778 miles travelled by C J Piper, billed to the taxpayer at £0.45 per mile for a staggering £1,250. 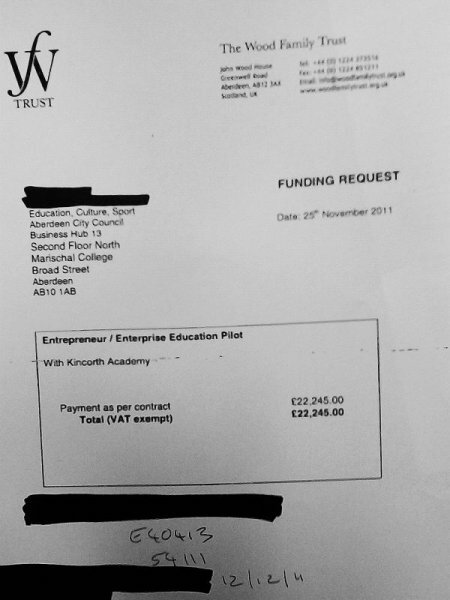 This appears on an invoice from May 2011 to 6 March 2012, totalling £19,380 inclusive of VAT. As green carbon capture schemes go, this scheme has a great deal to make up for (providing any of the trees, currently surrounded by weeds) manage to grow. Bryan Massie Woodland Management Ltd did quite nicely out of the scheme as well, spraying herbicides. Anyone can see the chemicals did not exactly save the Phase 1 trees, and Phase 2 growth is already surrounded by high weeds. Astute council observers will recall the blackmail deal offered by Malone: give us £225,000 for fencing, or we kill the deer. She insisted we had no money for fencing. The public were urged by all interested animal charities not to give into this blackmail and the precedent it would set. Somehow, money for fencing was found anyway – yet the deer were still exterminated. Highland Estate Services were paid £480 per day to clear our gorse; their Invoice No. 547 shows them receiving £4,608 from the city. The city had to return £43,800 to the Forestry Commission for the dismal failure of Phase 1, but this seems to have no place in the 2010 or 2011 accounts. This figure was paid rather late; it was demanded of us in November 2010. The Commission had to chase the city, which eventually paid in March 2011. Yet the sum was not reflected in accounts to December 2011 (received under FOI legislation), nor is this figure reflected in the 2011 scheme. The council should explain where this figure appears in the books – it is clearly part of the tree scheme. If it were to be combined with the net expenditure recorded in 2011 of £39,798.41, then we have spent £83,598 (minimum) on a scheme opposed by 2,400 people, several community councils, and animal charities including the Scottish SPCA. This should be a matter for serious investigation by Audit Scotland and Standards in Public Office. It has enriched a few businesses, served as a Liberal Democrat mantra and compromised what was once a rich meadow teeming with wildlife. “This is a failed WGS planting scheme. The scheme failed due to inadequate protection from deer and weeds. On the 4th November 2010 we issued Aberdeen City Council with an invoice for £43,831.90 – the reclaim of monies paid out under the above contract. “This invoice was to be paid within 30 days. The monies have not been received. This invoice is now accruing interest and has led to a payment ban being put in place over your Business Reference Number”. What Ms Watts eventually admitted: this money was paid in March 2011. She continues to deny the Tree for Every Citizen Phase 1 planting at Tullos and St Fitticks has any connection whatsoever to the Tree for Every Citizen Phase 2 planting at Tullos and St Fitticks. This is a nice bit of semantics, but would it stand up to an auditor’s scrutiny? I can find no record of Pete Leonard going back to the Housing and Audit Committee and advising them the scheme which he promised was cost neutral would be nothing of the kind. You might be forgiven for thinking an officer of the city should account to the relevant committee (if not the public) when his figures were found to be faulty. Whether the expenditure was £39,798, £83,598 – or considerably higher when taking into account the 2010 costs – this scheme was never going to be cost neutral. One hopes that the flight costs were reasonable; they were in many cases not disclosed. In terms of carbon capture, so important to Leonard and Malone when it came to Tullos Hill, perhaps we could have preserved the hill and lowered our carbon footprint simply by not flying these mandarins around the globe. Perhaps attending our Oil and Gas event at the AECC would not have been sufficient to advise people Aberdeen has something to do with the oil sector. Perhaps nothing was more essential than the Regensburg Burgerfest Festival, or knocking around Australia for economic development purposes. However, would it be more prudent and somewhat more in keeping with current austerity measures to do more teleconferences and cut out the air miles? Who knows? One or two events less and our former Lord Provost and his wife might have made some saving on their dress allowance, which of course comes from the public purse. ACSEF is an economic forum where our richest and most influential business people are supposed to give us an advisory forum. The quango, however, transformed itself from ‘forum’ to ‘future’, and this unelected body, existing to further business interests uber alles in our city, regularly gives advice to City and Shire governments, which are expected to rubber-stamp ACSEF recommendations. Under the stewardship of chair Stewart Milne, ACSEF decided the city’s special area of conservation at Loirston should have been transformed into a ‘community’ stadium (and then somehow a private stadium which Milne would decant AFC into, turning AFC’s historic grounds into housing for his own profit). How Mr Milne was able to wear his ACSEF, property developer and AFC Chairman hats without having any conflict of interest is unclear. It is perfectly clear ACSEF wanted a ‘spade in ground’ project at Loirston, coincidentally favouring its chairman’s business interests in the process. The Aberdeen and Grampian Chamber of Commerce submitted their Invoice No. 42810 dated 18 April 2011 to Aberdeen City Council – for ‘public relations services (ACSEF)’ – this bill has some of the familiar features of the invoices prepared by The BiG Partnership (its members no stranger to various quangos, boards, city groups) to the city for ‘AWPR’. BiG was at the time also getting the city to pay for ‘AWPR’ public relations services. This Chamber of Commerce invoice is for £1416 to cover ‘public relations services (ACSEF)’, ‘newspaper licenses and cutting service’, and (partially redacted) ‘photography, energy industry conference, town house’. In summary, ACSEF’s PR services seem to be invoiced via the Chamber without the actual supplier being specified, much like the City Gardens Project invoices were. BiG also bills the city via central government for ‘AWPR work’ as shown in Part 1. The Chamber refused to say which organisations’ services it was billing the City for at ACSEF’s directions when it came to the City Garden Project. So much for straightforward, transparent procurement and invoicing. (See The Great City Gardens Project Gravy Train article for more on those City Gardens Project invoices from the Chamber to the taxpayer). As well as serving as clearing house for City Garden Project and ACSEF-related costs, the Chamber charges £300 per year for membership – which the Kirkhill school paid via Aberdeen City Council, with a few hundred more for the city’s annual membership. People might be forgiven for thinking decisions are made in Aberdeen by a network of powerful, self-serving individuals; there certainly is a smidgeon of evidence to support this view. It is too late to get any of this 2011 money back. It is not too late to call to account those who may possibly have overstepped their remits, wasted public money, caused environmental damage, and who enjoyed clothing allowances, portraits, parties and foreign junkets while the rest of us were coping with bills and noting a downturn in city services. It is down to the new administration to look at the past, stop that which should be stopped, and investigate what should be investigated. It is hoped the new council will give us a more robust financial accounting system going forward, one that spends wisely and respects the public, the environment and the public purse. In a move meant to demonstrate transparency in government, August 2012 saw the opening of a statutory period in which members of the public were able to view Aberdeen City Council’s financial year documents for 2011. In the first of a two-part investigation, Suzanne Kelly seeks answers but winds up with more questions. In 2011 Aberdeen moved from being an SNP/Lib-Dem controlled city to an administration with a slim Labour majority. Although drains on the public purse like the Tullos deer debacle and the development of the Granite Web’s TIF funding application were left behind, the public still had to bear the cost of the previous administration’s policies. Staff at the ACC finance department were most helpful but the year-end document on display was not the detailed set of accounts I had hoped for. The year-end statement made many claims about the city doing the best it could but most of the costs had already been lumped together and processed. I wanted to see actual invoices and spread sheets from some of the year’s more contentious projects (or at least those I knew of). I provided the list of invoices and accounts I wished to examine and eventually received the information collated and ready to inspect. I have to say seeing the various costs involved is a far cry from reading the wonderfully prosaic year-end statement, and though I am still sifting through documents looking for answers, here are some issues that emerged. ACC and Stewart Milne are in legal dispute over land transaction issues at Westhill. The city sold land to one arm of the Milne empire at far less than its market value on the understanding it would eventually see a share of any future profit. At the same time Milne companies were buying and selling land at knockdown prices, they were submitting bids for council projects (at very narrow margins compared to the competition), winning work worth approximately £10m. The courts – including the highest in the UK – sided with ACC and Milne should by rights be settling his debt to the city. The paperwork I was given is intriguing, referencing neither particular jobs nor targets reached. Indeed, three of the documents entirely lack a second sheet containing supplementary information. The cover sheets I did receive refer, for example, to Bryan Park and Hayton Road, but fail to indicate exactly what work is being paid for, or if any target has been reached. For the sums involved, one might hope sufficient documentary back-up evidence does exist. It was a good year to be in PR. Well, it was if you were a certain BiG name agency. There was the unofficial campaign for the Granite Web – when print media was sent to every household in the city on at least two occasions (and lest we forget, in error to the shire on one). BiG was involved in other areas, though at present we don’t know which PR agency the city paid when the Chamber of Commerce (Chaired by Bob Collier) billed ACC for work ordered by ACSEF (Tom Smith) in support of the Granite Web scheme. Smith is, of course, better known as a director of the Aberdeen City Gardens Trust, a private company to which the management of the web and UTG was to be handed without recourse to a tendering process or checking either man’s expertise in the rather narrow field of constructing concrete webs. The BiG Partnership billed ACC for £54,176 in the last fiscal year: was the AWPR acronym used in the invoices referring to the Western Peripheral Route? Other possibilities seem slim, but why ACC should have engaged a PR firm (let alone paid it storage fees or for website servers) in relation to this project is not clear. a) ACC regularly deals with a company holding preferred bidder status, a company that has not only reneged on a profit-sharing scheme but dragged the city through every court in the land. How much was lost on the initial transaction? How much is the city incurring in legal fees, and which side picks these up? Why is the Milne group apparently saying it wants to negotiate when the courts have already found against them? Have Milne companies retained their preferred bidder status? If his companies were enjoying profits from a favourable land deal, while at the same time entering low bids for contracting work, is this ethical, fair, and completely within tendering guidelines? b) Should the referendum have been financed to such an extent by one of the interested parties? Was there even a slight possibility of psychological influence over those involved in administration of the referendum by the fact the costs were picked up by the web’s main proponent? At one stage we were told the entire costs were being met by Wood – why did the taxpayer pick up a £40,000 tab? d) Has the city paid for public relations for the AWPR? If so, how was the contract for the work tendered? Was BiG given favoured status in obtaining this work via its involvement with ACSEF and the CGP? Aberdeen Voice’s Odious Susannah takes a look at this past week in Aberdeen, and tries to make some sense of it all. By Suzanne Kelly. What a week! I felt pangs of pity for the disgraced captain who left the sinking ship. His reputation in tatters, he jumped before the entire thing could sink completely, taking his lovely companion with him while others were left to flounder. Yes, it is true: John Stewart has jumped the LibDems and is heading to Manchester. But who to take the helm of the wreck of HMS LibDem? Who’ll be strong enough to shoot the Tullos deer, wise enough sit on boards that redact their minutes, and courageous enough never shirk from public debate when it suits them? Whose record this past year puts them streaks ahead of the other Lib Dems? Who can that new captain be? Why, it is none other than Aileen ‘Ho’Malone. I wish her all the best in her new role, and hope she will bring her stewardship talents so evident in the Tree, dead deer, and pesticide spraying for Every Citizen campaign to the Lib Dems – that would improve their standing no end. We also learned that her husband Brian is going to be running for election – this will be Scotland’s own Kennedy dynasty before we know it. And that’s not just because of Aileen’s hairstyle looking like Jackie O’s. I was at Wednesday morning’s City Council meeting to speak against Union Terrace Gardens being turned into a carpark/theatre/shopping mall, especially before the referendum happens. No surprises for guessing the outcome – we’re going to go ahead and keep the ducks in a row for the project to go ahead, and have set aside a mere £300,000 for the legal costs. The legal costs will be massive obviously – like when Stewart Milne had to pay something like £500,000 to sell property from his left hand to his right hand. The council meeting started on a serious note; The Lord Provost announced there is a leak in the city council. It seems our on-time, fantastic, £60 million-pound bargain revamp of Marischal College has a ‘wee’ problem: the bathrooms have stopped working on the upper floors. At first I thought they were ‘taking the p’, but then I gave the Council’s reception a tinkle, and they told me it was all true. Indeed: the City Council is full of it. Let’s hope they get to the bottom of this problem soon. Either way, it looks like more taxpayer money will be going down the pan. There is currently a huge ‘out of order’ sign to be found at Marischal College: this may or may not be connected to the toilet problem. Why am I not ‘Old’ but ‘Odious’ Susannah this week? Because John Stewart says I am an ‘odious individual’. I’ve been having the most enchanting exchange with some of our elected officials this past fortnight – Odious Susannah is putting together another little matrix. This will show councillors’ answers to questions of the day, hospitality registers and declarations of interest compared to directorships shown in Companies House – there are a few differences here and there that you might find amusing. The matrix will show who’s voted how on a few issues. Nothing special – just who wants to shoot your deer, close your schools; whose votes closed Choices, who wants to spend more money and time on the City Garden Project before the referendum, and so on. Most of the replies that are in are casual and not very exciting, but leave it to Neil Fletcher to spice up my life again. You’ll be able to read his reply alongside some of the less exciting ones soon enough. But here is where I became Odious. I crossed the line when I asked leaders of the parties whether or not they would allow councillors a free vote on Wednesday concerning the future of UTG. Naturally I am opposed to this project going anywhere before a referendum is held. I hope you and your parties will prudently oppose measures coming before the Council on Wednesday. I would like to know if your political parties will be enforcing a party line or allowing a free vote. On a separate matter I have received a good number of polite responses to the questions/issues email I sent some weeks ago. The results will be published shortly, so if any of your party’s elected councillors wishes to respond, they should do so by Wednesday. (Failures to respond will be noted as well, and the one astonishingly rude reply published in full, too). The Liberal Democrat group does not operate a whip. And you really are in no position to complain about rudeness. Is your self-awareness so lacking? You have consistently attacked some of my colleagues, particularly my female colleagues, online in a very personal, vile, nasty and vicious manner. Your actions marks you as an odious individual and I suggest if you can’t take a bit of the heat, you should maybe reconsider your widely-rumoured plan to try and enter the Council kitchen in May. Please feel free to publish. Welcome to our world, where people whom you have never net [sic]pass judgement based on what they read! No, it is true I never did ‘net’ the catch that is John, but that’s because some lucky person caught him before I did. But I’ve never met the man, either. Also my hard luck. But somehow, I do feel able to judge people I never met. Do you know how I manage this seemingly impossible feat? I look at what they have done and what they do. How they vote, what services they cut off, what they want to do with green space. Harsh of Old Suz, I admit – but yes, I do judge some people without even having met or netted them. John branded as ‘asbo-deserving’ the Church of Scotland when it wouldn’t behave as he wanted it to, and like the Churlish Church, I will have too just carry on somehow. It is a shame we will not part as great friends. 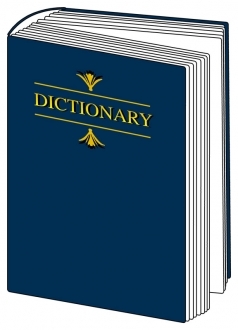 But that’s enough background – time for a definition or two from the web – not the granite one that will make us all rich and Aberdeen the centre of the architectural universe, but the world-wide one, and how some public relations companies operate on it. When a professional lobbyist or public relations operative uses a website such as Facebook or Twitter to appear to be a grass-roots movement instead of what they really are – a company hired for PR purposes. This astro-turfing is done to try to gauge and/or gain public support. It is a very odious thing to do, and most websites prohibit it, as does a code of practice for PR companies. Do your local newspapers seem filled with stories about the benefits of the concrete ramps over UTG? Who or what made Old Odious Susannah think of astro-turfing? Step forward the Facebook entry of one Miss Katy Campbell who according to her ‘Linked In’ site (whatever that is) is an Account Administrator at The BIG Partnership. Good for her. No doubt she isn’t aware of the fact she should not astro-turf, but she seems to have done so. No doubt her motives were selfless – her Facebook presence had been extolling the virtues of turning UTG into the web. Don’t bother to look for the postings anymore – once she was rumbled, they were all taken down. No doubt her superiors at The BIG Partnership also made an apology on FB and explained why it was inappropriate not to disclose whether you work for an agency when posting things promoting what your agency does; Old Suz just didn’t find it yet. NB: Linked In says she is into croquet, burlesque and debating: let’s hope not simultaneously. 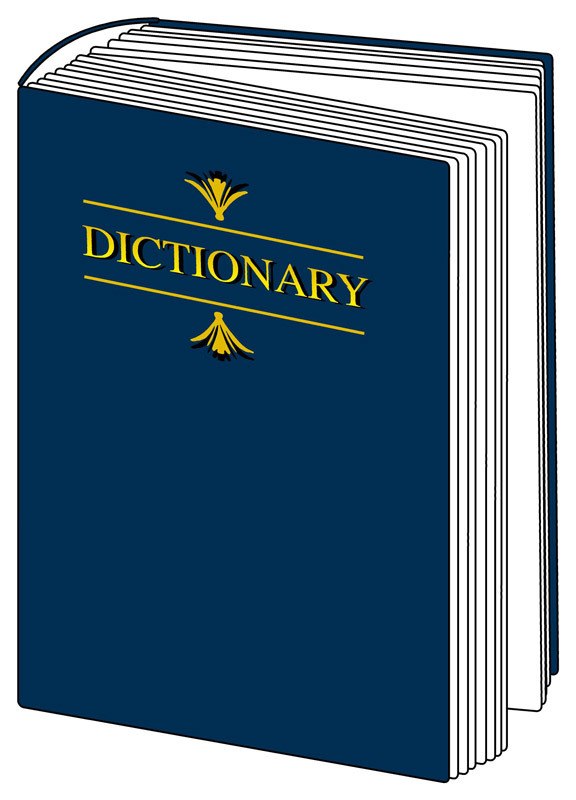 Public Relations Offensive: (modern English phrase) A burst of media activity, lobbying, advertising, etc. to get a point or product into favour with the public. You may not have noticed, but someone somewhere seems to be attempting a PR offensive. Do your local newspapers seem filled with stories about the benefits of the concrete ramps over UTG? Are the papers saying that building the ramps will bring over £122 million per year into our economy and create 6,500 jobs? Are you being shown news polls that show 4 out of 5 (if the sample was that large – I doubt it) P&J readers want the teletubbie garden? Good News! The trees are gong to stay in the gardens forever! If so, there just might be a public relations offensive in play. All this extremely inoffensive pr is meant to show how much greater life will be for all of us (except the 200 year old trees, rooks, bats, peregrine falcons, red kites.,.) if we literally level the playing field that is UTG. The new Facebook community sits, some seemingly started by the BIG partnership’s opeartives, are a great place to get your questions about the gardens answered. Unless of course you are asking if the Facebook page was started by a PR company; those questioned don’t get answered as far as I can tell. However, someone asked which trees will be felled and what will happen. Good News! The trees are gong to stay in the gardens forever! AS BITS OF THEATRE SEATING, WOOD DECKING AND WOOD CHIP! Result! Sure it will be hard luck on the animals that live(d) in the trees, but perhaps they can be stuffed and kept forever too? We in Aberdeen are surely going to be stuffed at any rate. Another brilliant PR wheeze is to send visiting ‘professionals’ to schools to talk to young people. It was apparently ‘Money Week; in Cults last week (I don’t think we have ‘Money Week’ in Torry…). From several accounts, some ‘merchant bankers’ came to school to tell the children of Cults that Ian Wood and Stewart Milne have started from scratch and now do great things for the community like building heated driveways – sorry – like building affordable housing, and really are quite nice chaps. Apparently Union Terrace Gardens was not mentioned to the children – who were just told how great these local worthies are – so that’s ok. No indoctrination or brainwashing going on there then. PR Offensive? I’d say so. 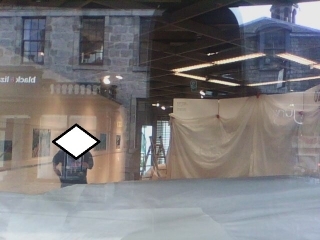 Aberdeen Voice reporter Suzanne Kelly attempts photography around Union Terrace Gardens Design Exhibition, only to be threatened with police and forced to delete some photos from phone. Last week a news story showed just how far security had over-ridden basic civil rights, as a father from Glasgow was apparently cautioned by both private shopping mall security and police. He had taken a photo of his daughter atop a child’s seat within the confines of the mall in question. It seems signs warned shoppers against taking photos, and this otherwise perfectly harmless photo wound up being a cause celebre. A Facebook campaign to boycott the mall was organised, and the suddenly contrite shopping mall seemed to have changed its colours. Perhaps Apardion Security (motto: “job done”) which work Aberdeen’s Academy Shopping mall and Aberdeen City Council didn’t get wind of this story. Despite absolutely no signs prohibiting photography being visible in the mall itself – despite my taking a photo while standing on a public street of a poster – I was followed by security from one mall to the next, cornered, threatened with police and legal action being implied – and forced to delete some (but not all) photos from my phone: from a guard who refused to say who he was or who had given him this instruction to stop photographers. I had spent a pleasant morning at an event in town – Prince Charles had arrived to unveil and dedicate a statue erected to commemorate the Gordon Highlanders. It was a great morning, a well-attended event, and provided a good opportunity to talk to Gordon Highlanders, who were all happy to talk about this now legendary unit, sadly resigned to history in 1994. At the end of the event, I bumped into two separate people who had been taken aback by the over-enthusiasm of security guards at the Academy Shopping Mall. The mall, with several vacant shops, is to be the home of the public exhibition of the six designs shortlisted to win a competition to replace the city’s Victorian Union Terrace Gardens with some form of design centre/parking/shopping/’cultural’ space. The actual competition shop is not within the Mall itself but in the old ‘Pier’ outlet on Belmont Street, formerly a Presbyterian Church which houses a tribute to Mary Slessor. Aberdeen’s other memorial to Mary Slessor lies in Union Terrace Gardens and would be obliterated by any new design. Many journalists have written to reflect the public’s dismay at the proposal to change the gardens. They are the remains of the Denburn Valley as landscaped in Victorian times. They are the only city-centre green park and contain listed, ancient trees – some of the few trees in the City Centre, seen as vital against air pollution. The City it should be rememembered is nearly £500 million in debt, and does not have money for this project, estimated to cost upwards of £140 million. A local millionaire has offered £50 million to change the gardens into something else, an anonymous donor wants to give another £5 million, and the rest will come from Tax Incremental Funding if the City succeeds in a bid to be one of the pilots of the TIF scheme. If TIF is secured, local retailers will pay increased rates if the area is commercially successful (so trees are not exactly what’s wanted). And as is suspected, such increased taxes on the retailer will be passed onto the consumer in the final analysis. With the tales of the two people being harassed, I went to Belmont Street where the space for the exhibitions has a large glass front. I took a photograph of a long, thin poster advising that the public display of the shortlisted designs would be forthcoming. I also stood on the steps of the shop front (where absolutely no signage warned me against taking photos), and took a single shot of the poorly draped glass window and the paltry displays that were being set up. Then I left. I went inside the Academy shopping centre itself, and noticed a poster saying what shops were in the Academy. This poster, on a round pillar, advised that several of the shops were vacant. I thought that would be a good photo. The premise of those who want to build in Union Terrace Gardens is that shops will revitalise Aberdeen. 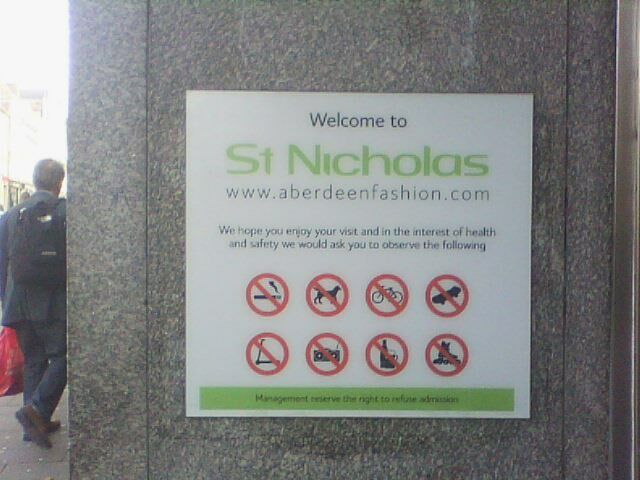 Aberdeen’s problem, as any first-year economic student would confirm, is not a lack of shop spaces. Vacant shops are found all across the city centre, as large multinationals offering cheap goods (often made abroad) are taking customers who in more stable economic times would probably have preferred to buy from local shops. As I was considering this shot I had my mobile in my hand, and was suddenly very aware of a security guard eyeing me as if I were a criminal. I made a quick call to a friend to say I was going to Marks & Spencer, and I left. I had by now taken three photos – one of the poster visible to all the world on Belmont Street; one standing on the steps of the shop where the exhibition would be, and one inside the academy showing the rear of the exhibition area. We then looked at my photos. There were only three. The guard didn’t make me delete this. “I don’t need to know who you are and you don’t need to know who I am” he cut across me. I deleted the phone photo he told me to. I had moved – deliberately – outside the shopping centre and stood by the very clear, permanent sign which had symbols of prohibited activities. In the heat of the moment I noted ‘no radios’ ‘no eating’ ‘no skateboarding’ – but no ‘no photography’ sign. I mentioned this to the guard. At this point I took a photo of his back as he scurried away, and another of the prohibited activities poster. The public are largely against borrowing money to build in Union Terrace Gardens, this was reflected in a public consultation. Those who are determined that something should go there now have no fewer than 9 entities – either specific vehicles invented for the project, private companies, the quango Scottish Enterprise, and the local economic forum ACSEF promoting the project. There is also a public relations company (which also apparently represents the Wood Family Trust, involved in the project), the Big Partnership. It seems as if one or some of these entities are very keen that no one should get any press on the exhibition, certainly no photographs. Perhaps they will be pleased with the public relations the heavy-handed security measures have provoked. Perhaps not. But if those behind the Union Terrace Gardens ‘design’ project do not want the poster advertising the event photographed, may I kindly and gently suggest it not be posted on a public street? At the time of publishing, the shopping mall’s staff are unable to comment, and suggest I contact the manager on Monday. Two security guards are apparently standing in front of the storefront on Belmont Street this afternoon, and are reportedly stopping anyone taking any photos.